I’m very pleased to see that Netflix has implemented my last idea, at least in part. Although they haven’t created my “dream queue” idea, you are now able to see movies that exist in Netflix’s library, but which are currently unavailable for streaming. 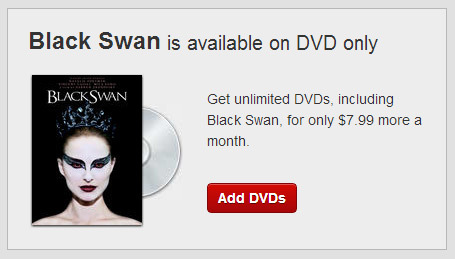 Now when you search for a movie that is unavailable for streaming (for example, Black Swan), Netflix shows you any available titles, as well as the unavailable ones. I couldn’t be more pleased! At least now I know that those films exist in the library. Which is why I said Netflix was missing out on a major marketing opportunity. Back in October, I said that Netflix could take advantage of such a system to suggest that Instant users buy a DVD package. Well, that’s exactly what they’ve done. If you click on the unavailable title in the search box, you’re taken to a page that suggests you buy a DVD package, and suggests some titles that are available for streaming. So thank you, Netflix. You did well to take my advice. Even if you didn’t.